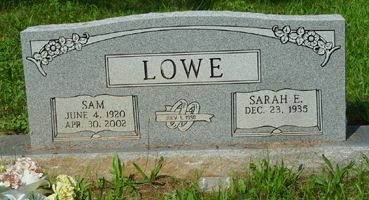 Sam Lowe, son of Jack Lowe and Lillie Sanford, husband of Sarah. Sam Lowe, 81, of 34 Montgomery Street, Cartersville, passed away on Tuesday, April 30, 2002 at Emory Cartersville Medical Center. He was born on June 4, 1920 in Bartow County, the son of the late Lillie Sanford Lowe and Jack Lowe. He is retired from Lake Mining Company where he was a washer. He is preceded in death by his parents, three sisters, Nettie and Annie Lowe, Mae Sweed, four brothers, Buster, Jody, Jack and George Lowe. Survivors include his wife of 51 years, Sarah E. Lowe, four sons and daughters-in-law, Frank Lowe of White, Joseph and Alesia Lowe of Taylorsville, Same Lowe Jr. and Timothy Lowe, both of Cartersville, three daughters and sons-in-laws, Martha Delmar Strange of White, Carolyn and Time Chapple of Kingston, Susan and Bob Tordrup of Cartersville, one brother Noel Lowe of Cartersville, 16 grandchildren, 14 great-grandchildren and several nieces and nephews. Funeral services will be held on Thursday, May 02, 2002 at 2 p.m. from the chapel of the Parnick Jennings Funeral Home with the Rev. Jesse Sanford, and the Rev Larry Lowe officiating. Interment will follow in Old Macedonia Cemetery.